I have found some interesting research paper from About.com. They are releasing findings of a study on search behavior called "Three Mindsets of Search". The “search type” segmentation encompassed 59 variables of search behavior, and was developed through cluster analysis. 1. Answer Me (46% of all searches) – People in a “answer me” search want exactly what they ask for, and no more, delivered in a way that allows them to get to it as directly as possible. 2. Educate Me (26% of all searches) – People in an “educate me” search want 360 degrees of understanding, and multiple perspectives on critical topics. They will search until their goal is achieved – this may stretch over long periods of time and through related topics. 3. 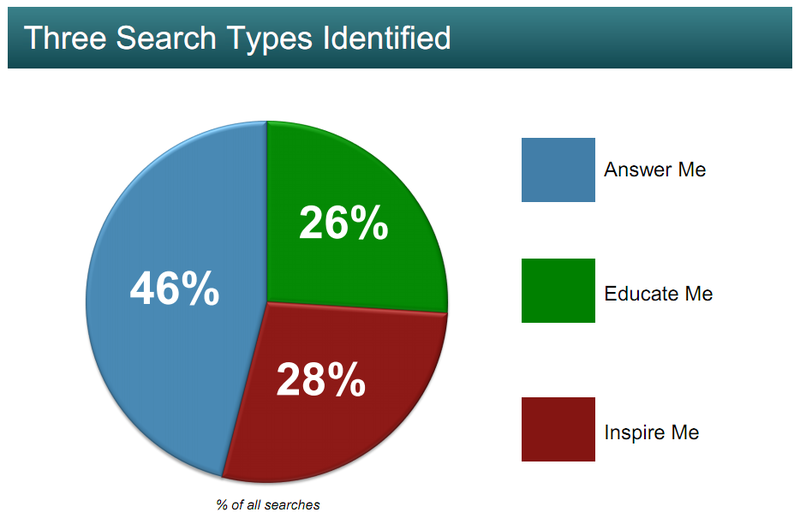 Inspire Me (28% of all searches) – The fun “browsy” type of search, where people are looking for surprises, have open minds and want to be led.